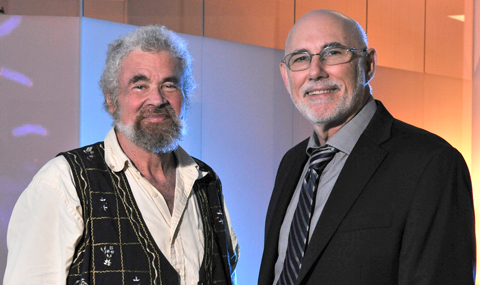 Dr. Jerry W. Shay, Professor and Vice Chairman of Cell Biology at UT Southwestern, and colleague, Dr. Woodring E. Wright, Professor of Cell Biology and Internal Medicine, found that 6-thio-2’-deoxyguanosine could stop the growth of cancer cells in culture and decrease the growth of tumors in mice. “We observed broad efficacy against a range of cancer cell lines with very low concentrations of 6-thiodG, as well as tumor burden shrinkage in mice,” said Dr. Shay, Associate Director of the Harold C. Simmons Comprehensive Cancer Center. Dr. Shay and Dr. Wright, who hold The Southland Financial Corporation Distinguished Chair in Geriatrics, are co-senior authors of the paper appearing in the journal Cancer Discovery. 6-thiodG acts by targeting a unique mechanism that is thought to regulate how long cells can stay alive, a type of aging clock. This biological clock is defined by DNA structures known as telomeres, which cap the ends of the cell’s chromosomes to protect them from damage, and which become shorter every time the cell divides. Once telomeres have shortened to a critical length, the cell can no longer divide and dies though a process known as apoptosis. Cancer cells are protected from this death by an RNA protein complex called telomerase, which ensures that telomeres do not shorten with every division. Telomerase has therefore been the subject of intense research as a target for cancer therapy. Drugs that successfully block its action have been developed, but these drugs have to be administered for long periods of time to successfully trigger cell death and shrink tumors, leading to considerable toxicities. This outcome is partially because cells in any one tumor have chromosomes with different telomere lengths and any one cell’s telomeres must be critically shortened to induce death. 6-thiodG is preferentially used as a substrate by telomerase and disrupts the normal way cells maintain telomere length. Because 6-thiodG is not normally used in telomeres, the presence of the compound acts as an “alarm” signal that is recognized by the cell as damage. As a result, the cell stops dividing and dies. Telomerase is an almost universal oncology target, yet there are few telomerase-directed therapies in human clinical trials, researchers noted. “Using telomerase to incorporate toxic products into telomeres is remarkably encouraging at this point,” said Dr. Wright. Importantly, unlike many other telomerase-inhibiting compounds, the researchers did not observe serious side effects in the blood, liver and kidneys of the mice that were treated with 6-thiodG. UT Southwestern researchers collaborated with researchers in the Department of Biochemistry at Hacettepe University in Ankara, Turkey, including Ilgen Mender, Visiting Junior Researcher at UT Southwestern, and Zeliha Dikmen; and Dr. Sergei Gryaznov, Chief Technology Officer with AuraSense Therapeutics. The work is supported by a SPORE (Specialized Program of Research Excellence) grant from the National Cancer Institute, the Harold C. Simmons Comprehensive Cancer Center, and the Southland Financial Corporation Distinguished Chair in Geriatric Research. UT Southwestern’s Harold C. Simmons Comprehensive Cancer Center is the only National Cancer Institute-designated cancer center in North Texas and one of just 66 NCI-designated cancer centers in the nation. The Harold C. Simmons Cancer Center includes 13 major cancer care programs with a focus on treating the whole patient with innovative treatments, while fostering groundbreaking basic research that has the potential to improve patient care and prevention of cancer worldwide. In addition, the Center’s education and training programs support and develop the next generation of cancer researchers and clinicians. In addition, the Simmons Cancer Center is among only 30 U.S. cancer research centers to be named a National Clinical Trials Network Lead Academic Site, a prestigious new designation by the NCI, and the only Cancer Center in North Texas to be so designated. The designation and associated funding is designed to bolster the cancer center’s clinical cancer research for adults and to provide patients access to cancer research trials sponsored by the NCI, where promising new drugs often are tested.